Going to Catalina means a trip through the world's busiest port, Long Beach, California. Richard Henry Dana described his view of Santa Catalina Island from what would one day be Dana Point, in his classic memoir, "Two Years Before the Mast." You can catch a high-speed ferry to Catalina for less than $75 round-trip, or you can follow Dana's wake in your own boat. Some preplanning provides both a safe, uneventful passage across the Santa Barbara Channel and a memorable adventure. From the Long Beach East Breakwater light to Catalina is about 22.5 nautical miles. The passage to Catalina, from Dana Point by way of the San Pedro Channel, is slightly shorter -- about 18.5 nautical miles. As you cross the Santa Barbara Channel from Dana Point, the currents generally set boats to the west. Coming from Long Beach, you might find yourself running headlong into currents flowing to the north, pushing you back toward the mainland. Regardless of your starting point, you’ll probably travel through a controlled area. Both Long Beach and Dana Point are under the supervision of the U.S. Coast Guard’s Long Beach-Los Angeles Vessel Traffic Service. 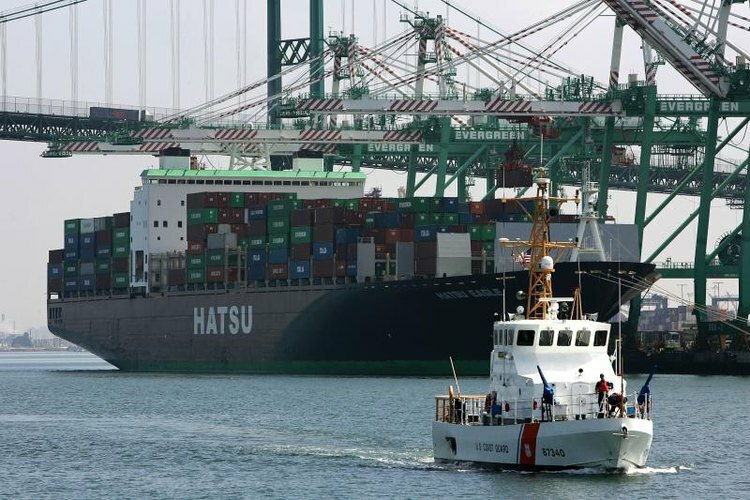 The Port of Long Beach and Los Angeles has heavy civilian and military marine traffic that’s regulated by the VTS. If you monitor VHF Channel 16 while within the VTS boundaries and comply with VTS instructions, you can avoid playing chicken with a 950-foot-long ship. If you plan to depart from Long Beach in a powerboat or auxiliary sailing vessel, you need a clear understanding of your boat’s fuel usage and should plan for an an extra hour’s worth of fuel both ways, plus a one-hour margin for unexpected delays, such as those that can occur in a VTS. If you’re in a pure sailboat -- one that has no auxiliary motor -- plan for the additional transit time. From the San Pedro Breakwater, the course to the island is 202 degrees; the return course is 022 degrees. From Long Beach Marina East Breakwater Light the course is 213 degrees and the return course 033 degrees. From the Long Beach Breakwater, rather than the Marina East Breakwater, the course to Catalina is 208 degrees and the return course to the breakwater is 028 degrees. Once you’re offshore, you'll experience both westerly and northerly currents that will affect your passage to and from Catalina. You should remain cautious as you approach or depart from the island, particularly at night. Before you slip your mooring line, take the time to look over the USCG Light List and compare it to your charts or charting system. You’ll see a variety of warning beacons, all with flashing red or white lights. Catalina Harbor is marked with a white light, light number 2630 in the USCG Light List, Volume VI, flashing every 4 seconds. Located high in Catalina’s hills, its nominal range is 7 nm. Catalina Harbor is a protected anchorage, with mooring buoys available. At Two Harbors, there are mooring and anchorage areas in 10 of Catalina’s coves. The length of your boat and the length of your stay at the island determine your mooring fees. You can make arrangements for an anchorage or mooring buoy on the Web at visitcatalinaisland.com/two-harbors/mooring-reservations before your trip, or with a call to the Santa Catalina Harbor Department on VHF Channel 9, prior to arrival.